In shallow bowl, stir together flour, herbes de Provence, 1/2 teaspoon of the salt, 1/4 teaspoon of the pepper and garlic powder. Coat chicken in flour mixture, turning to coat all sides. Heat olive oil in 10-inch skillet over medium-high heat. Add chicken to skillet; cook 4 to 6 minutes, stirring frequently or until chicken is brown and no longer pink in center. Stir in lemon peel, lemon juice, capers, wine, garlic and soup. Bring to a boil. Reduce heat to medium-low; simmer 10 minutes. Stir in peas and onions. Cook 6 to 10 minutes, stirring occasionally or until thickened. Add 1 tablespoon of the butter, 1/4 teaspoon salt and remaining 1/4 teaspoon pepper to chicken mixture in skillet. Stir until butter is melted. Remove from heat. Heat oven to 375°F. Carefully unroll dough; fold dough in half lengthwise. Press into 16x4-inch rectangle. Cut dough into 4 squares. In each of 4 (10-oz) custard cups or ramekins, spoon about 3/4 cup of chicken mixture. Place 1 piece of dough on top of each cup. Divide remaining 1 tablespoon butter among tops of pot pies. Sprinkle remaining 1/2 teaspoon salt and crushed rosemary leaves over tops of pot pies. Add 1 rosemary sprig to each pot pie. 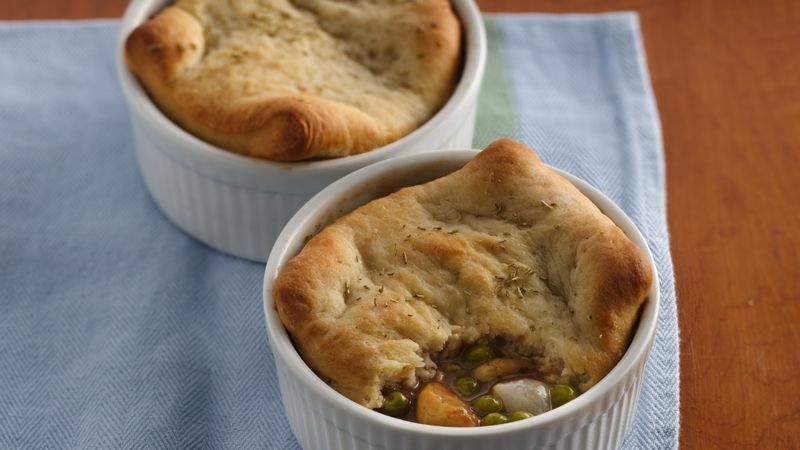 Place pot pies in 15x10-inch pan with sides. Bake 20 to 25 minutes or until bread is golden brown. *Two cups frozen peas and 1/4 cup chopped onion can be substituted for the box of peas and onions.